Smart911 is a free 9-1-1 service available in your community! Sign up for Smart911 to give valuable information about yourself, family members, your home,m pets and even vehicles that will be immediately available to 9-1-1 when you make an emergency call. These details can save valuable sedconds or even mintes during an emergency. Help your responders find you in an emergency. Please mark your mailbox and structure both with large color contrasting numbers. Tangipahoa 9-1-1 will soon begin a new public education campaign throughout our Parish. Our Board has purchased a variety of materials to give away to the public. Also we have had brouchures printed on Senior 9-1-1 information, teen info and proper addressing procedures. 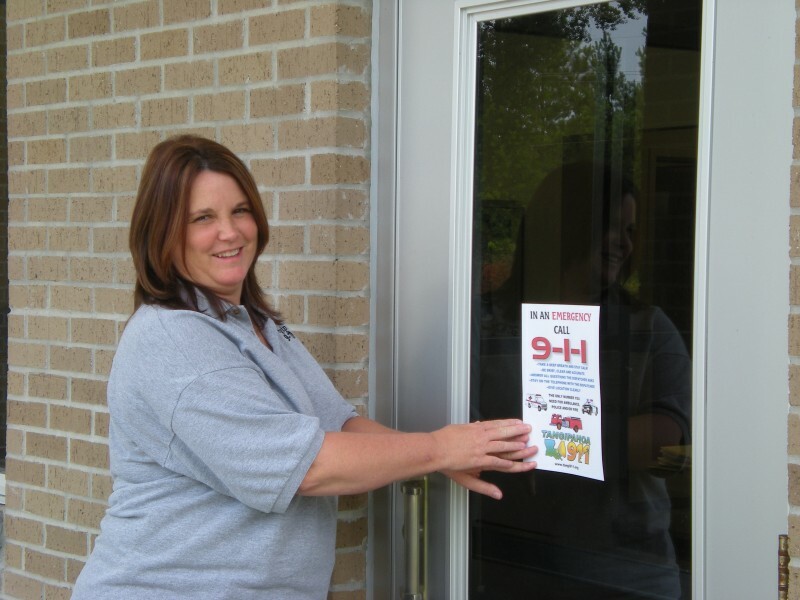 Here one of our telecommunicators is putting up a poster that we have made in house and putting in different City Halls, Post Offices, Fire Stations, Police Stations as well as other public buildings. We are also developing educational presentations and making them available to different groups (civic groups, homeowners assoc, etc) within the Parish. If you have a business or civic group that would like more information on 9-1-1 public education please contact our office. Know all of the options you have to communicate with 9-1-1 during an emergency, including all of your family members’ wireless phones and/or your home phone. In an emergency, having a dependable connection to dial 9-1-1 is essential. The more ways you have to contact 9-1-1 and reach emergency assistance, the better. Review existing communications devices and determine whether family members would benefit by adding any services or phones that enable everyone to stay connected. To help keep 9-1-1 calls down from outside area have a family communications plan in place. Designate someone out of the area as a central contact, and make certain that all family members know whom to contact if they become separated. Most important, practice your emergency plans in advance. Be sure you have a "Hurricane Phone." It's a good idea to have a regular type wired line phone on hand that is not dependent on electricity in case of a power outage. Cordless landline telephones usually have receivers that are electrically charged, so they won't work if you lose your power. Also multi line phones may need electricity. You can purchase an inexpensive phone to keep in your Hurricane Tool Box for as little as $5.00. Forward your home number to your wireless number in the event of an evacuation or if family members need to check on you with telephone wires down due to storm damage. Program all of your emergency contact numbers with the area codes (even in your area) and e-mail addresses into your mobile phone. Numbers should include the most important numbers you may need such as Doctor, pharmacy, 9-1-1, as well as your family members. Keep your wireless phone batteries charged at all times. Have an alternative plan to recharge your battery in case of a power outage, such as charging your wireless device by using your car charger, generator or having extra mobile phone batteries or disposable mobile phone batteries on hand. If you have an old cell phone that is still operational along with the charger, you may want to put this in your Hurricane Tool Box as well as a back up. This phone will be able to call 9-1-1, even without service, if you were to need help. Try text messaging your family if voice does not seem to work. During an emergency situation, text messages may go through more quickly than voice calls because they require fewer network resources. IMPORTANT – YOU CANNOT TEXT TO 9-1-1 AT THIS TIME, but you may notify a family member you need help. If your computer looses power your VoIP phones will not work so make sure your computer is on an auxiliary power source as well as your IP provider. You may need to try a normal land line phone in your house jack to ensure you can still call 9-1-1 over the wired network. Some cable TV companies tie into existing telephone lines within your building. If this is the case you may just have to unplug the telephone wire from the modem to your phone jack and normal service will be restored for 9-1-1 purposes. Others tie into your building system at the phone junction box and cannot be used in the same manner. You will have to keep electricity to the modem in this case in order to have any phone service. Additional information and tips for disaster preparedness may be found with your phone vendor. The Tangipahoa Communications District #1 is proud to announce that we have remodeled our communications room. Remodeling included taking out the old console furniture (12 positions) and replacing it with all new Watson Synergy 3 Center Lift Consoles (14). The new positions now have space for 6 21” monitors, full center lift up to 42”, and a convenience group that includes task lighting, fans, heaters, as well as easy access for technicians to work on equipment. Also included in the upgrade was an addition of 3 radio consoles. This gives 9-1-1 a total of 6 radio consoles for our fire dispatch operations and a total of 6 console positions with 700 radios within the room. New carpet flooring was installed during this time as well. All of this was done without taking down any of the centers operations due to our vendors (AT&T, EMCO, Electricians, and IT personnel, flooring installers, the Watson furniture installers and work crews from the Tangipahoa Parish Sheriffs Office. These vendors worked very well with and around each other to give us the ability to bring new equipment on line without losing any service to the public.